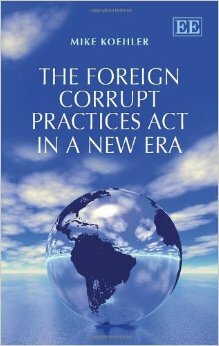 If you only read one book on the US FCPA, read this one. It will be US$150 well spent. Mike Koehler’s new book is probably the best book we’ve read about the FCPA. Covering, the before, the beginning and the now of the FCPA and its enforcement Mike (AKA the FCPA Professor – the name of his blog and coincidentally his occupation) carefully dissects the original legislation and tells us what the law is. He then tells us what that means in practice today (which is not necessarily what the law says) and explains the backdrop to the thinking of the SEC, DOJ, companies, politicians and advisers. For those wanting a pair of ‘FCPA goggles’ no book is, in our opinion, better. This does not mean the book is perfect. abolition of Non Prosecution Agreements and Deferred Prosecution Agreements (because they lack judicial scrutiny in the US). But the FCPA Professor’s underlying thesis and the observations made throughout the book to bolster the need for (the author’s) suggested amendments do not take away from the careful analysis and explanation of the FCPA, what it is and how it has been working in practice. We don’t agree with all the assumptions the author makes nor the opinions he expresses. But everyone is entitled to their opinion(s) #just sayin’ and we’ve certainly got plenty. Regardless, this book makes for important reading for lawyers, compliance officers and others the FCPA, and other anti-corruption laws, touch. For those faced with complying with the FCPA (and the way it is presently enforced) whether you like the FCPA and its enforcement in its current form, or not, ‘it just is’ and understanding what that ‘is’ is in the new era helps level the playing field for commercial actors viz. the government – something we believe in strongly by the way. One observation, those advocating for change in an imperfect world should sometimes be careful of what they wish for! The UK and the SFO are really leading the way here. For those seeking a narrowing of the FCPA and its enforcement we say 2/3 aint bad. We doubt they would agree. Our rating 5/5. Buy it.